This book takes a fresh look at the external relations of the European Union (EU) and in particular the Common Foreign and Security Policy (CFSP). Rather than focusing exclusively on the competence aspects of the institutions and actors, the book makes the case that the CFSP can be understood as a system of governance, which produces effects beyond the traditional tools associated with foreign policy. The theoretical approach draws on insights from new institutionalism, constructivism and the institutional theory of law and emphasises how the institutionalised forms of cooperation in the external sphere contribute to a social reality in which the ‘added value’ of the CFSP can be seen. 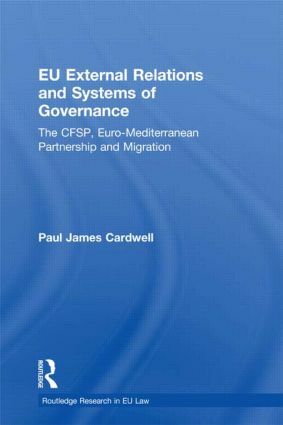 Paul James Cardwell takes the Euro-Mediterranean Partnership (EuroMed) as a case study. Not initially a CFSP project, EuroMed has become the frame for EU foreign policy in the region as an emerging system of governance in which the EU institutions play a central role. Having recently been relaunched as the Barcelona Process: Union for the Mediterranean, it is a topical subject. With the increasing importance of migration on the EU’s agenda, the book looks at the relationship between migration, EuroMed and the CFSP and argues that the legal effects of the CFSP can be felt beyond the Treaty-based instruments. EU External Relations and Systems of Governance will be of interest to students and scholars of Law, Politics and European studies researching in the dynamic fields of EU external relations and foreign policy, as well as policy-makers and non-governmental organisations striving to better understand how the EU and its systems of governance operate.